PicoSure is a seriously exciting innovation in the tattoo removal game. Not only is it much faster, it’s also better at removing difficult and old tattoos made of traditionally tricky inks like greens and blues. The previous gold standard of tattoo removal was the Q-switch laser, which use thermal energy to heat up ink particles in the tattoo to the point where they break apart. The smaller molecules are then reabsorbed by the body and the tattoo simply disappears. Instead of heat, PicoSure uses ultra-short pulses one trillionth of a second in length to hit the tattoo particles with massive amounts of pressure, smashing them into tiny pieces much quicker than a laser can and getting rid of the tattoo much faster. Picosure also doesn’t heat up the surrounding skin so it hurts less than traditional lasers, helps you recover faster and ensures the skin stays undamaged. 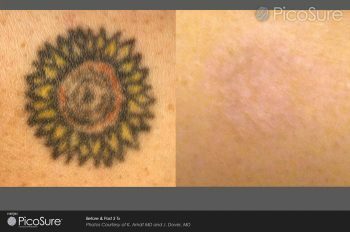 PicoSure can even be used to remove tattoos that Q-switch lasers have failed to get rid of, or that have stopped fading even after being treated. Even on the greens and blues, which are the most difficult colours to remove, Picosure still manages to get amazing results. Of course the number of treatments you need depends on factors including tattoo size, age and colour. At Pulse Light Clinic we’re pleased to be able to offer PicoSure tattoo removal to our clients; for more information or to book a consultation, contact us today. We’ll get rid of that tattoo for you. If you would like further information about the PicoSure laser or to view the price list, please visit this page.